The one road south to north on Jura roughly follows the line of the east coast. Fifty minutes of driving around some interesting bends brought us to Inverlussa, twenty-five miles from the dock at Feolin. 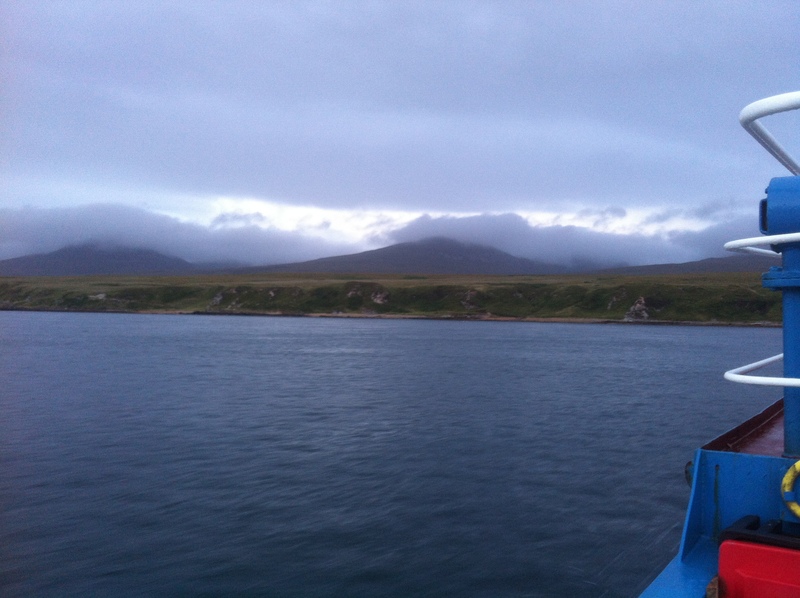 The notorious Paps of Jura were shadows within cloud as we passed them, but the range of hills behind showed as a vast, jagged wall. We arrived at Inverlussa late in the afternoon. We were renting heather cottage for a week because of its relative nearness to Orwell’s Barnhill, and the whirlpool of Corryvrechan. The key was in the door. Inside, the living room was high ceilinged, clad in white-washed tongue-and-groove planks with a simple fireplace. The bookshelves contained genuinely readable books and local literature. The kitchen was small and well-equipped. I put the kettle on and hung our damp clothes above the fireplace on a clothes rack suspended by a pulley. We brought in our luggage and multiple bags of food and wine, almost enough for a week of good eating. I made a pot of tea. J went out to collect coal from the coal shed and engineer a makeshift barbecue. When I went to help and share wine, I found her lighting charcoal whilst suffering our first encounter with midges. Soon, we were inside with the fire, eating char-grilled lamb steaks, halloumi, fresh made flat-breads, salad and red wine. Outside the window, highland cattle and deer crossed the bridge over the Lussa river and began to mooch around in front of the house. J and Rob surveyed the map to decide what we should do the next day. We would go to Ardlussa Bay. To get there, we walked back along the one road and through the Ardlussa estate. There were ancient stone outbuildings still in use, an open double door revealing a beautifully organised collection of tools and an alcove containing at least a hundred empty bottles of Jura whiskey. We brought a picnic with us, Rob had his Kindle, and I carried the beach casting rod I’d bought recently in Cornwall. The owner of the tackle shop there had promised me a lesson off Pendennis Point, Falmouth, but never showed. In the forty minutes I was in his shop, he had drawn for me some guides of how to set a line. Today, it was to be float fishing. I prepared my line-as per the diagram- after breakfast to avoid fumbling on the beach. The sea at Ardlussa Bay is clear, you can easily follow occasional ribbons of seaweed-drifts to their roots in the shingle. After a while sitting, smoking, reading, Rob waded into the bay and swam eastward to a ridge of rocks four hundred yards away. There was a steady cross current, he made gradual progress. About twenty minutes later, he climbed out onto the rocks and was surprised when we pointed out several quite deep lacerations on his body, no doubt inflicted by the sharp shelving of the outcrop. When we had first got to the bay, J and I ambled about, digging among the tiny pebbles, crab elements and sea-smoothed coal. I remember being acutely conscious that beach-combing should be a singular pursuit, yet J’s movements, always somehow in my periphery, beckoned me; today, I just wanted to be close to her. I found a small black rectangular stone with an exact white X across one of its faces. I gave it to her. We sat gently for some minutes before I headed around the north edge of the bay to find a fishing spot on a spit of rock that curved around the headland. The bay was fringed with yellow iris and tufts of marram that gave way to saturated grass as I walked upwards onto a sloping chase. There was a large paper target nailed to a wooden frame, splintered with rifle fire. I ducked behind and made my way through a narrow band of firs into dense rhododendron thicket. I plunged inside, rod in hand, threading myself ever deeper into a diabolical network of stone-hard rhododendron branches. I knew the others were expecting me to emerge onto the headland, and so pushed inwards toward what I knew would soon be the edge of a cliff. The trouble was, I had no idea where it would be, such was the density of the strange, semi-tropical foliage. I felt like Laocoon, hung in a three-dimensional game of Twister. The leathery leaves thickened above me and blocked out the sun, my foot slipped and I dropped about ten feet directly down. Somehow, the rod stayed intact, but it was clear that I was now very much snared in this unnerving place. I was in the foundations of an old croft that must have stood on the coast here a hundred years ago. One of the walls remained, but the rest was granite-rubble, utterly subsumed within the monstrous organism. I felt very alone. Rob and J could only have been a quarter of a mile away, but I was by no means sure I’d be able to extract myself. I peered out at the sea through a tunnel of forked boughs; there, a few hundred yards out from the cliff, a small herd of seals were sunning themselves on a rock. The others had to see. There was no way I was staying here. I javelin-ed the rod through a gap above me and lunged upwards. I caught hold of a snaking limb, swung myself into the canopy, and painstakingly spider-ed my way through the endless loops. I was the end of a knotted piece of string, being drawn through one bight after another. After I finally escaped and stood in fresher air, I realised I had utterly lost my sense of time. I could have been fifteen minutes or an hour in that gloom. Looking back, the experience was uncannily like a recurring dream I used to have as a child. I was in the cellars of some vast industrial space. It was always dim and claustrophobic, there were innumerable hot water pipes and ducting, giant cogs smeared with grease, a cement floor and the faint humming of unseen machinery. I can’t have had this dream for at least twenty years but, back then, it would revisit me at least once every few weeks. I walked back to the bay. J caught sight of me and strode to meet me. She didn’t know how glad I was to see her, how the sight of her gave me heart. We hugged. I probably pressed my face into the hollow above her clavicle. I told her about the seals and we decided to get to where we could view them by edging around the base of the cliffs. We managed this easily, I used the rod like a tightrope walker’s pole to balance along some of the sheer edges. We rounded a small inlet, then found we could peer across at the islets in the water. There they were, the herd of seals, still basking. It was clear the tide was rising and that soon they would be buoyed away. We skipped along the spit of land that narrowed into lively waves. After initially attaching my reel upside-down, I made ready for my first cast into Scottish waters. I flicked the rod behind me, and flung it forward. The ball weight smacked miserably into the sea barely five metres from where I stood. Even worse, my line unspooled into wild coils that sprung rapidly outward, becoming instantly knotted. I was silently furious, embarrassed. I had a white and blue nautical shirt on, my best hat, decent kit- I looked the part. But now it was clear, I hadn’t a clue what I was doing. J came over, wordlessly. Her fingers deftly reordered the wire and wound it back around the reel, her fine hair brushed my face as the wind blew, calming me. Her hair and the line became, for a moment, indistinguishable. I cast again. This time, the float caught in the seaweed at the base of the rocks. J knelt and extricated it. Rob arrived from his swim, we marveled at his cuts, his endurance of the cold. While they both went to watch the seals, I cast again and again. I gradually improved, learning the gearing of the reel, which position to keep the bale in. My casts eventually reached about thirty yards. I caught nothing. When the seals were evicted from their rock by the tide, we made our way back around the edge of the shore. I swam out into the middle of the bay, taking in the amphitheatre of land about us. My head bobbed on the surface the way a seal’s does. I watched J curled on a rock in the sun, Rob had a cigarette. Time stalled a little. I returned to the shore, dried myself and lay against J’s warmth, anchored. We walked a mile or so north on the road towards Lealt. There was a small cairn on a rise at the road’s edge. J observed: That is the least impressive cairn I’ve ever seen, it’s more like an elephant turd. The air became humid, the flora about us seemed to vary, as if we passed through shifting hemispheres. There were huge ferns, then weathered beeches; deforested slopes of burnt trees, then dense woods; moments of moorland and swift burns; countless mushrooms: slippery jacks, false chanterelles, an orange boletus. There were huge dragonflies. We turned back after admiring the coastline from a crumbling vantage point. Just before we descended to Inverlussa, we watched a herd of Whiteface Woodland sheep grazing. One particular sheep with jester-like, asymmetrical horns wandered across to a neighbour and pissed liberally on its head. Rob named him Crumplehorn and headed home. From Feolin, we drove around the southern edge of the island, eyes scouring the moors and coastline for the Jura-ness of this new place. Something dark and sinuous sprang across the road, none of us knew what it was. Young pheasants were scrutinized lest they be something more highland– ptarmigan, grouse, perhaps. We eased down the road into Craighouse as the sun finally began to fall. We had travelled around 513 miles. 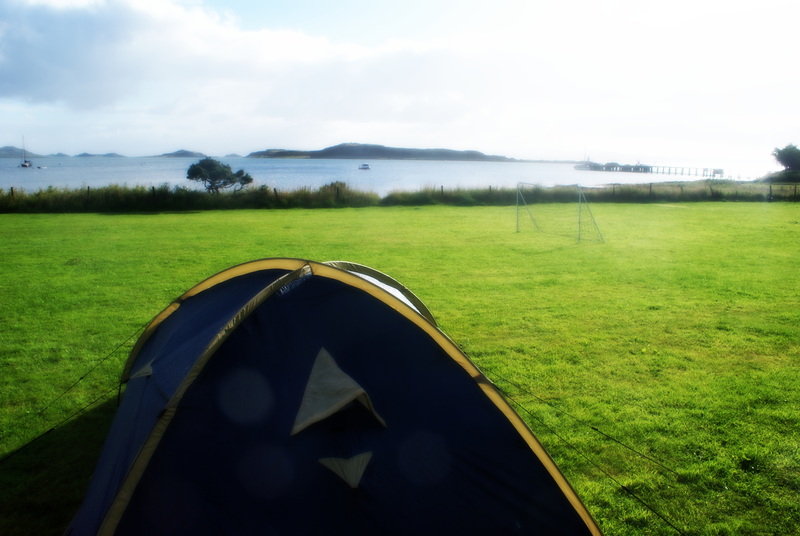 Camping is free on the lawn beside the sea in front of the Jura Hotel. In the grainy light, we pitched our tents. J had understood the depth of my hanger earlier, and had phoned ahead to have food prepared at the hotel before the kitchen closed. I love her in many ways, but when she makes food happen in times of need, the feeling becomes something religious. Once our duvets were stowed in the tents, we entered the hotel amidst a wedding party. A live band began. We sat exhausted in a bay window and ate chicken and potatoes, lentil bake, ales and Jura whiskey. Slainte. Thank god. Simple, nourishing food and strong drink had us soon heading back out into a soft night of gentle drizzle. We zipped ourselves into our tents and lay down. The sound of the wedding singer’s Mick Hucknell-esque vocals, and a strangely arhythmic drummer soon faded as we fell into heavy slumber. Morning came gently, its light filtered through the opaqueness of my tent. I lay cossetted beneath a billowing white duvet, skin against J’s. I drank water and unzipped the door. I stepped heavily on dewy grass, unsteady and unbalanced from yesterday’s journey. On the pebbled shore, I left my towel and slowly walked into the pure, cool sea of Small Isles Bay. We breakfasted in the hotel (we were late, made do with tea and bacon butties), left the tents until later, walked out of Craighouse and onto the moor. Along the road, we passed a paradox that Rob, being a collector of odd signs, could not resist. We passed one of the warehouses where the Jura distillery leaves its whiskey to silently mature, the angel’s share drifting out through the timbered walls, lost on the wind. The yard was stacked with hundreds of empty casks. We left the road and entered the dark margin of a small pine wood where many of the trees were toppled, unable to support themselves in the wet ground.. Moving forward was tricky, we leapt criss-crossing channels of peaty water, scampered low beneath the spiny branches. The dark, resin rich floor was strewn with red mushrooms, many of them Russula emetica, The Sickener. A sudden rainstorm met us when we ducked out from the fringe of pines. Deer spotted us at a thousand yards and moved deftly upwards. Our initiation into true bog lay between us and the small waterfall we were heading for. In bog, each footstep must be carefully considered for potential stability and tactical advantage. Once committed, a footstep should be continually monitored in order to assess the extent to which it has sunken into the bog, and/or is becoming rapidly flooded. Should this occur, the appropriate action must be immediately taken: either leap maniacally away like a Gaelic dancer under fire, or sink heroically, ignoring the creeping ooze entering your shoe. We each opted for both of these many times. Beautiful enough on a dull day. I lead the way upwards on terrain that was less waterlogged and becoming springy with small, rotund accumulations of moss. As we neared the top of Brat Bhein, a sudden heavy rainstorm blew down on us, forcing us to scatter and take cover in the leeside of the hill. 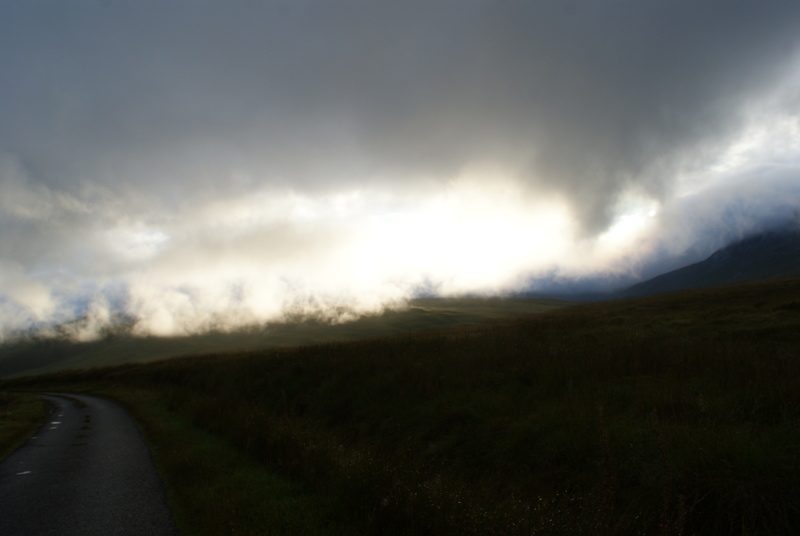 It was like being behind a waterfall, but cossetted in a gentle fold of the hill within waterproofs, while fierce rain struck the hillside, inches from my face. Again, it soon passed and we gathered together by the triangulation point at 309m. We weren’t bothered to reach the summit, the glinting loch below was calling. I pressed my face into J’s shoulders, and we kissed. All of us took in the view in all directions. I bounded off, plunging down into ferns and heather, soon reaching the shore of Loch a ‘Bhaile – Mhargaidh. Rob and J joined me, we sat and picnicked there, wavelets breaking at our feet, a wind of heather scent and clarity passed over us and upwards. Something animal showed in the shallows, I took off my shoes and waded in. A deer antler under the water, one of countless shed yearly by one of Jura’s more than eight thousand red deer. I would have kept it, but there was a visceral, jellyed sinew still attached to its base. I cast it away. Rob suggested we skirt the edge of the loch, rather than climb up and around. We coastered, then, laughing, slipping, occasionally dunking our feet around the eastern edge of the water. At its far end, the loch met a man-made wall with a low channel made for letting the loch’s overflow fall downhill as a stream. We skipped across, sipped a little coffee and began our journey back. We had tea in the Jura tea room, went back to the field in front of the hotel and took down our tents. 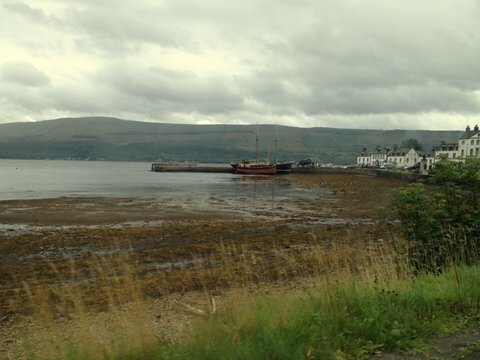 I drove out of Craighouse onto the only road on the island towards Inverlussa. It’s been twelve days since I returned. For that whole time I have been carrying clear, watery, scented thoughts and experience, both tranquil and strained, like casks of fresh water in a boat at sea. Nearly every day I have felt that I must try and open the sluice on what Jura is, and how it is to be transported to a place so empty of humans, so beautiful and so full of what exists when we are not dominating. How it was to go there with the one who is more beautiful than anything, who it showed me to be, and what it showed me about how fragile life is, I am, we are. 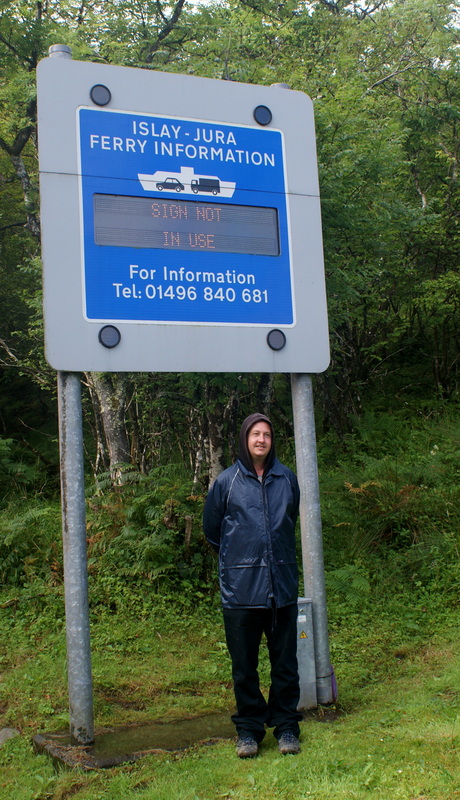 My son’s godfather, Rob, got to Bristol on the Friday evening and we drove to Jura the following morning, Saturday, 17th August. It took us around four hours to get to Glasgow. We listened to Rob’s choices of music initially. I particularly remember liking the singing of The Dirty Projectors. I swapped the driving with J, and nodded off as we passed through the drama of the Lake district, (http://www.visitcumbria.com/m6/). I woke in Scotland, about forty five minutes south of Glasgow, gradually getting more and more excited about returning to the city I’d spend my first year of Uni at (in 1994). The architecture of Glasgow, particularly through Ibrox, Partick to the West End is comprised of tenement blocks and grand avenues, long faded. The pubs along the main road through Partick were all of a type entirely foreign to this car full of comfortable southerners: hollow, faded dives behind peeling wooden frontings; dark, drear, almost empty grog holes that promised piss-saturated urinals and a punch in the mouth. We stopped near the University. We walked up Byers Road, and I had the uncanny experience of being in a place I both knew and did not. It felt incredible to be on Byers Road. There was an incredible fishmonger- we had an oyster each for lunch that was like a sudden dunking in the Irish Sea; my mouth, startled by the restorative, was invigorated with the raw mineral essence of the ocean. 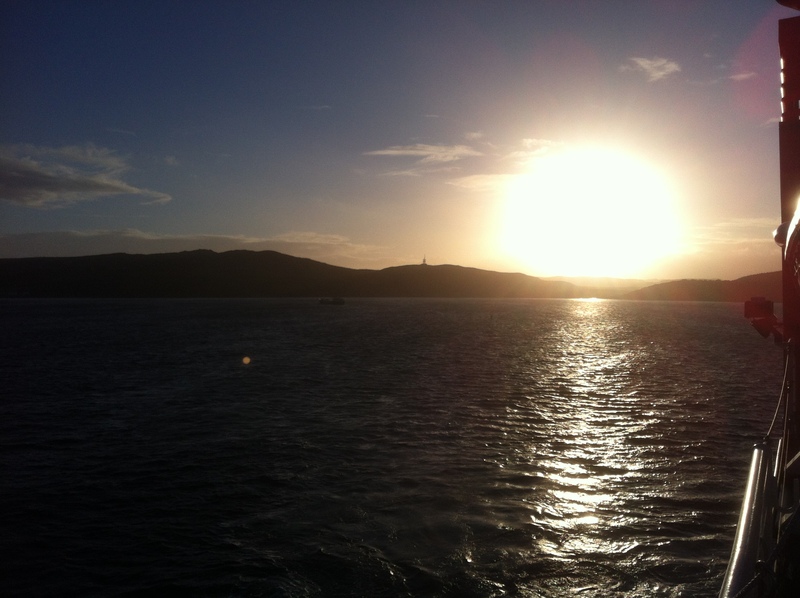 We bought enough fine food and wine for five days and headed out towards Loch Lomand. 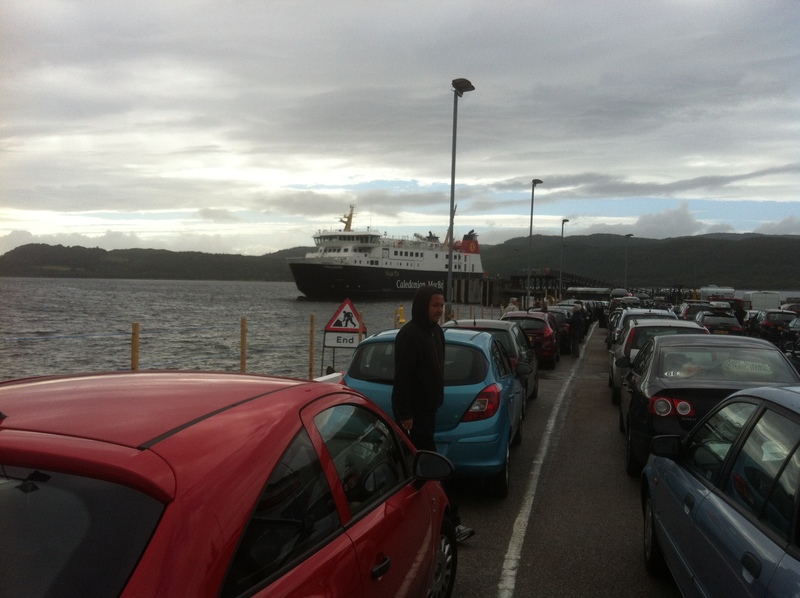 then drove briskly to our ferry at Kennacraig. Start your engines. Board me. the beautiful lighthouse and the white facade of the Port Ellen Maltings. As we disembarked, a woman sounded her horn accidentally with colossal, pendulous breasts. We left most of the cars behind at Port Ellen, and drove out into a landscape of bog, moor and distant mountains. Near Islay airport, there were pool-sized trenches cut into the land, plastic bags of the harvested peat stacked alongside. 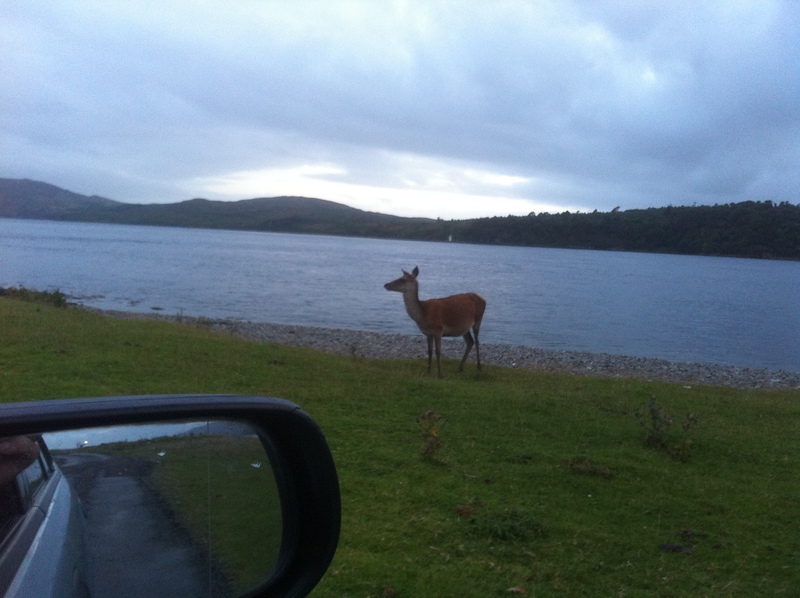 Red deer and stags grazed the water’s edge as we drove off the tiny ferry.